Remember Asus said it had something to wow us prepared for Mobile World Congress? Well, it has released a short viral video-style trailer to amp up anticipation ahead of the launch of said exciting product, and although it doesn’t really contain any actual facts, one can read plenty into the images used. Visiting the URL printed on the final image in the video shows we’ll be treated to a second teaser on February 21, and that we’ll meet the product on February 25, when, “Pad and Phone come together.” Sound familiar? It should, as Asus is the company behind the PadFone and PadFone 2. The PadFone 2 was announced late last year, but it has yet to receive a wide release, with the UK and the U.S. still waiting for a final date. Could Asus be relaunching the PadFone 2? It’s a trick they pulled with the first PadFone, a device unveiled as a prototype and then again as a final retail product at MWC 2012. Perhaps, but then it has also been linked with the unimaginatively named Fonepad, a smaller tablet with phone capabilities built-in. The rumored device is said to feature an Intel Z2420 processor, a 7-inch screen and Android 4.1 Jelly Bean. The video certainly makes a point of showing the spacecraft firmly “docking” with the church, so if it’s not the PadFone 2 again, the new device could work in a similar way. Then there’s the reference to metal and the distinctly metallic look to the Asus craft, meaning whatever it is could have a metallic chassis. 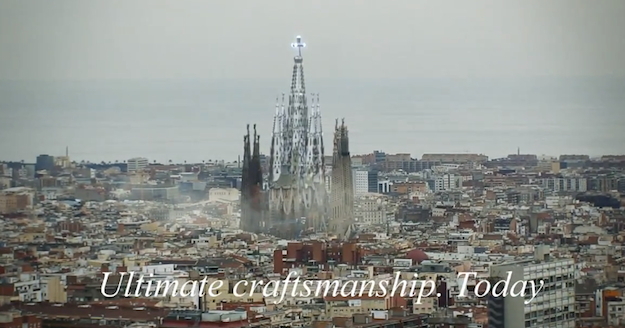 Finally, there’s always the chance we’re supposed to take the video literally, and Asus is letting us know the aliens are coming to finish off the Sagrada Familia once and for all. Perhaps when the next trailer is released we’ll have a little more to go on, but failing that, we’ll get all the facts on February 25 at MWC.